Abstract This workshop mainly focus on the latest and exciting invention in Arabic medicine research and development, the main motto of the workshop to expand the hidden and forgotten benefit of Arabic medicine, specially Hijamah (Wet Cupping), Amale Kai (Cauterization), Fasad (Venesection (phlebotomy)) and many more. More than 90 kinds of diseases or symptoms were selected and treated by Arabic Medicine & cupping therapy according to included studies. Biography Moin Bubere has done BUMS in 1994, MD (Unani) in 1999 and PhD (Islamic Medicine) in 2004. He was awarded with best doctor of India, and many appreciations. 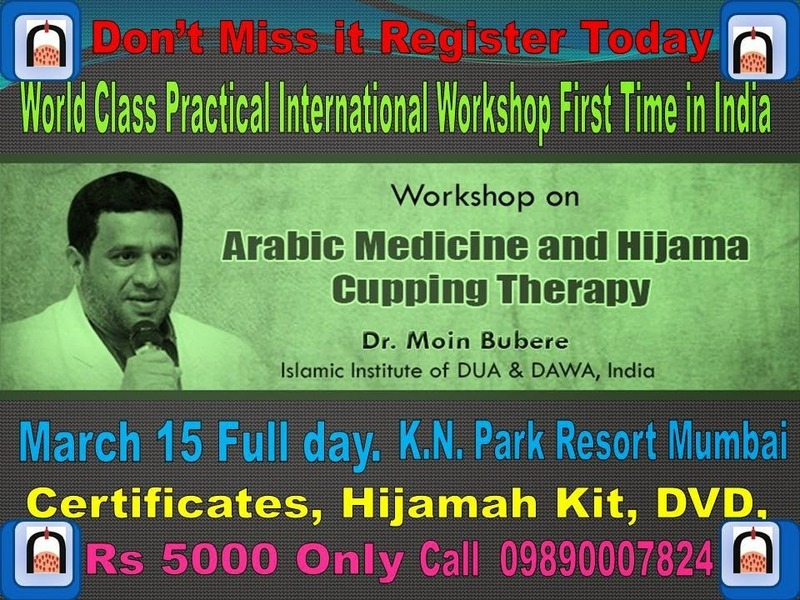 He was the Founder of Al Ahad Clinic in 1995, Islamic Institute of Dawa & Dua in 1997, Cautry Skin Clinic in 2000, Al-Hijamah Cupping Cure Center in 2004, Herbs & Hijamah Online Clinic in 2006 and many followed the pipeline. He delivered talks in 27 national and 10 international seminar and conference speeches and attended many conferences around the world, presented 14 research papers. He also has publications to his contribution which includes Mano Salwa, Islamic way of life, Hijamah Cupping – The world’s best medicine and others. Registration: Rs 5000 up till 5th of March, then Rs 6000 till 10th of March, on the spot registration is Rs 7000. It includes breakfast, lunch, Hijamah kits, DVD, certificate. nd Dawa from India for sharing the above post. If you have any questions or want to leave some feedback on their training, then please do so via a comment* below.